Walt Disney Studios has been on a roll lately, and the forecast is strong for Disney movies in 2018. After crossing the $6 Billion mark for the 2017 worldwide box office, Disney became the only studio to break $5 Billion in global returns three years in a row. If Disney’s going to continue that streak, they will have to rely heavily on Marvel Studios offerings with three film releases for the first time as well as sequels for Pixar’s The Incredibles and Disney Animation’s Wreck-It Ralph. Lucasfilm’s second stand-alone film, Solo: A Star Wars Story, comes to theaters after a rocky production path, and Disney movies in 2018 concludes with the return to a classic – Mary Poppins. Below you’ll find the descriptions, release dates, and links to our individual pages for all Disney movies in 2018. We’ll continue to add images, news, and trailers to each film’s individual page as we get more information. So take a look below and let us know what Disney movies in 2018 you are most excited about. Hail to the king! Marvel Studios’ BLACK PANTHER follows T’Challa (played by Chadwick Boseman) who, after the death of his father, the King of Wakanda, returns home to the isolated, technologically advanced African nation to succeed to the throne and take his rightful place as king. But when a powerful old enemy reappears, T’Challa’s mettle as king — and BLACK PANTHER — is tested when he is drawn into a formidable conflict that puts the fate of Wakanda and the entire world at risk. Faced with treachery and danger, the young king must rally his allies and release the full power of BLACK PANTHER to defeat his foes and secure the safety of his people and their way of life. Click here for our spoiler free review of BLACK PANTHER. From visionary director Ava DuVernay comes Disney’s A WRINKLE IN TIME an epic adventure based on Madeleine L’Engle’s timeless classic which takes audiences across dimensions of time and space, examining the nature of darkness versus light and, ultimately, the triumph of love. Through one girl’s transformative journey led by three celestial guides, we discover that strength comes from embracing one’s individuality and that the best way to triumph over fear is to travel by one’s own light. 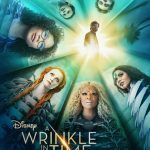 With an incredible cast including Oprah Winfrey, Reese Witherspoon, Mindy Kaling, Gugu Mbatha-Raw, Michael Peňa, Zach Galifianakis, Chris Pine, and screenplay by Jennifer Lee, the Oscar winning creator of FROZEN, Disney’s A WRINKLE IN TIME opens March 9, 2018. Click here for our spoiler free review of A WRINKLE IN TIME. Avengers Assemble! Marvel’s AVENGERS: INFINITY WAR will be the culmination of Phase 3 of the Marvel Cinematic Universe and where the Avengers, meet Guardians of the Galaxy, meet Spider-Man, to team up to fight Thanos. AVENGERS: INFINITY WAR will hit theaters May 4, 2018, with the second part following on May 3, 2019. More than 10 years in the making, since IRON MAN (2008), AVENGERS: INFINITY WAR ties together an entire series of films, resulting in the Avengers finally facing off with Thanos and his Gauntlet of Infinity Stones. Thanos will be, without a doubt, the most threatening villain the Avengers team has ever faced. Click here for our spoiler free review of AVENGERS: INFINITY WAR. Han Solo – Smuggler. Scoundrel. Hero. A new Star Wars story begins. The adventure-filled past of the iconic scoundrel and everyone’s favorite Wookiee will explore the duo’s adventures before the events of Star Wars: A New Hope, including their early encounters with that other card-playing rogue from a galaxy far, far away, Lando Calrissian. Ron Howard is directing the movie, with a cast that includes Alden Ehrenreich as Han Solo, Woody Harrelson, Emilia Clarke, Donald Glover as Lando Calrissian, Thandie Newton, and Phoebe Waller-Bridge, with Joonas Suotamo as Chewbacca. Click here for our spoiler free review of SOLO: A STAR WARS STORY. Everyone’s favorite family of superheroes is back in INCREDIBLES 2 – but this time Helen (voice of Holly Hunter) is in the spotlight, leaving Bob (voice of Craig T. Nelson) at home with Violet (voice of Sarah Vowell) and Dash (voice of Huck Milner) to navigate the day-to-day heroics of “normal” life. It’s a tough transistion for everyone, made tougher by the fact that the family is still unaware of baby Jack-Jack’s emerging superpowers. When a new villain hatches a brilliant and dangerous plot, the family and Frozone (voice of Samuel L. Jackson) must find a way to work together again—which is easier said than done, even when they’re all Incredible. Directed by Brad Bird, INCREDIBLES 2 busts into theaters on June 15, 2018. Click here for our spoiler free review of INCREDIBLES 2. Marvel Studios’ ANT-MAN AND THE WASP re-unite the original cast including Paul Rudd, Evangeline Lilly, Michael Peña, and Academy Award winner Michael Douglas and introduces Academy Award nominees Michelle Pfeiffer and Laurence Fishburne to the Marvel Cinematic Universe. In the aftermath of Captain America: Civil War, Scott Lang (Rudd) grapples with the consequences of his choices as both a Super Hero and a father. As he struggles to rebalance his home life with his responsibilities as Ant-Man, he’s confronted by Hope van Dyne (Lilly) and Dr. Hank Pym (Douglas) with an urgent new mission. Scott must once again put on the suit and learn to fight alongside The Wasp as the team works together to uncover secrets from their past. Click here for our spoiler free review of ANT-MAN AND THE WASP. In the heartwarming live action adventure DISNEY’S CHRISTOPHER ROBIN, the young boy who loved embarking on adventures in the Hundred Acre Wood with a band of spirited and loveable stuffed animals, has grown up and lost his way. Now it’s up to his childhood friends to venture into our world and help Christopher Robin remember the loving and playful boy who is still inside. Click here for our spoiler free review of DISNEY’S CHRISTOPHER ROBIN. All Clara (Mackenzie Foy) wants is a key – a one-of-a-kind key that will unlock a box that holds a priceless gift from her late mother. A golden thread, presented to her at godfather Drosselmeyer’s (Morgan Freeman) annual holiday party, leads her to the coveted key—which promptly disappears into a strange and mysterious parallel world. It’s there that Clara encounters a soldier named Phillip (Jayden Fowora-Knight), a gang of mice and the regents who preside over three Realms: Land of Snowflakes, Land of Flowers and Land of Sweets. Clara and Phillip must brave the ominous Fourth Realm, home to the tyrant Mother Ginger (Helen Mirren), to retrieve Clara’s key and hopefully return harmony to the unstable world. Starring Keira Knightley as the Sugar Plum Fairy and featuring a special performance by Misty Copeland, Disney’s new holiday feature film Disney’s THE NUTCRACKER AND THE FOUR REALMS is directed by Lasse Hallström and inspired by E.T.A. Hoffmann’s classic tale. In theaters on November 2, 2018. Click here for more photos, news, and images for Disney’s THE NUTCRACKER AND THE FOUR REALMS. Walt Disney Animation Studios brings us back to the video game world for RALPH BREAKS THE INTERNET: WRECK-IT RALPH 2, the highly-anticipated sequel to 2012’s Wreck-It Ralph. Original castmembers Ralph (voice of John C. Reilly) and Sarah Silverman (voice of Vanellope von Schweetz) reprise their roles as well as Jack McBrayer as Fix-It Felix, Jr. and Jane Lynch as Sergeant Calhoun. RALPH BREAKS THE INTERNET: WRECK-IT RALPH 2, explores the world of online gaming and the internet and introduces Ralph to new characters including an encounter with all of the Disney Princesses. Academy Award winning director (Zootopia) Rich Moore returns and is joined by co-director Phil Johnston to helm the sequel. Click here for our spoiler free review of RALPH BREAKS THE INTERNET: WRECK-IT RALPH 2. Emily Blunt has been cast as Mary Poppins and Lin-Manuel Miranda will play a street lamplighter named Jack. Drawing from the wealth of material in P.L. Travers’ seven additional novels, the story will take place in Depression-era London (when the books were originally written) and follows a now-grown Jane and Michael Banks, who, along with Michael’s three children, are visited by the enigmatic Mary Poppins following a personal loss. Through her unique magical skills, and with the aid of her friend Jack, she helps the family rediscover the joy and wonder missing in their lives. MARY POPPINS RETURNS, the sequel to Walt Disney’s 1964 classic, “Mary Poppins,” will be released on December 25, 2018. Click here for our spoiler free review of MARY POPPINS RETURNS.